The thought of buying a car can be exciting for many people. The thought of fixing one up can be even more thrilling. Either way, once the engine revs up and hands grip the steering wheel one can find that their foot seems a little heavier than usual. As the speedometer needle shifts clockwise from left to right the radiator starts to work its magic. An affordable way to cool a high performance engine is by visiting Reliable Radiator. The store has paired up with OC Designs Online for a custom eBay store design. Now, they have a cool store design and sales are heating up! The header of this eBay shop design introduces customers to the customized storefront! The entire layout of the shop resembles a reliable radiator. The double’ “R” logo can be found front and center instilling a strong brand image at first sight. Customer service hours and numbers are located in the left corner so shoppers can see the shop has nothing to hide! The information panel lies in the light grey, top portion of the radiator. Customers can review all the store listings, read up on the shop and even browse customer feedback. If a direct search is what the customer is looking for they can use the “Quick Search” panel in the charcoal grey area. They can select a make, model and/or year for the type of radiator they’re looking to purchase! The midsection of this eBay store design warms up the store with red and black background colors. The left hand panels allow customers to shop by store category and enable customers to stay in the loop with a newsletter tab. 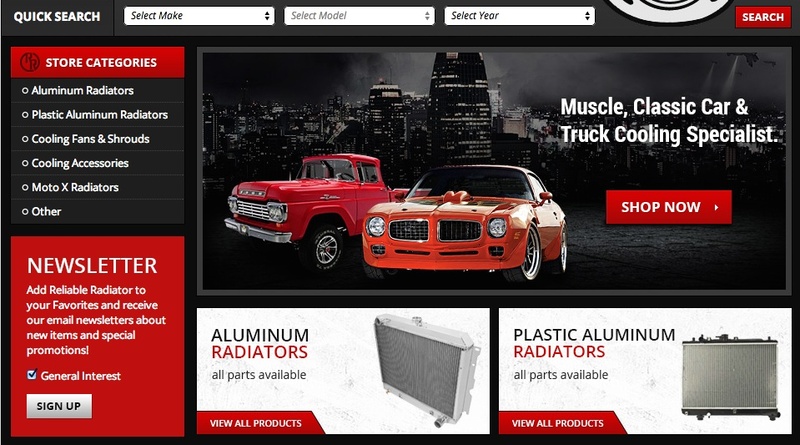 Simply click the red tabs labeled “View All Products” and “Shop Now” and the midsection will direct customers to a wide array of reliable cooling products. The footer of this eBay shop design is all about keeping products in the spotlight. A set of four tabs feature individual items for purchase on the shop. Each tab hosts a high resolution image, brief description, price and option to purchase instantly. Customers are one red tab away from having the item shipping to them in days! OC Designs Online have a wide array of eBay templates to choose from on the site. Take a moment to browse our portfolio and request a free quote. You won’t be disappointed! Also, don’t forget to find us on Facebook, follow us on Twitter and check out our Google+ Page.